New Sidewalks AND TREES for Otis Place | Park View, D.C.
At the end of June and beginning of July, I noticed that new sidewalks were going in on the section of Otis Place between Warder and Georgia Avenue. I also realized that this was one of the prime locations where there was an opportunity to add trees to the neighborhood … and that DDOT was missing it. I immediately contacted DDOT, and with the help of the Mayor’s office was able to meet with DDOT’s Deputy Director Greer Gillis and other DDOT folks on site to discuss the issue. 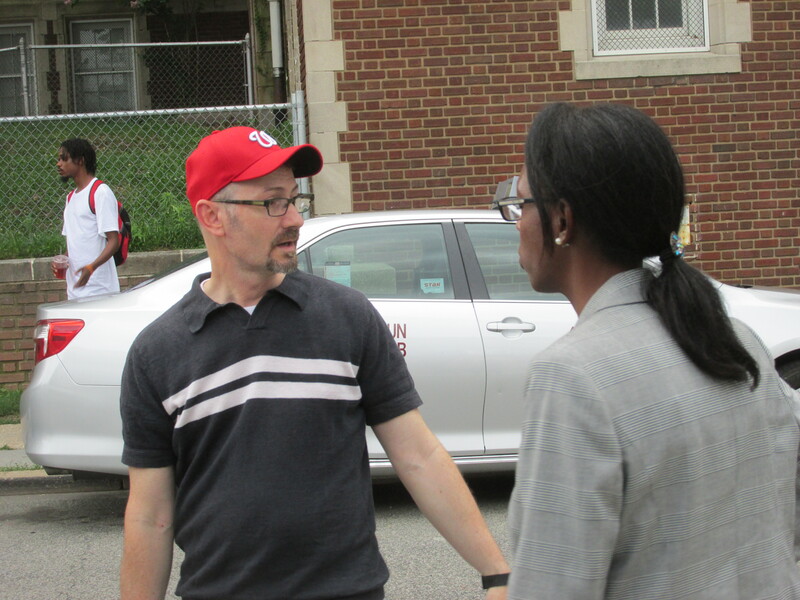 Commissioner Boese surveying sidewalks with DDOT Deputy Director Greer Gillis. During the meeting we looked for ways to incorporate trees as part of the sidewalk work. The area in question is the section between the elementary school and the recreation center. 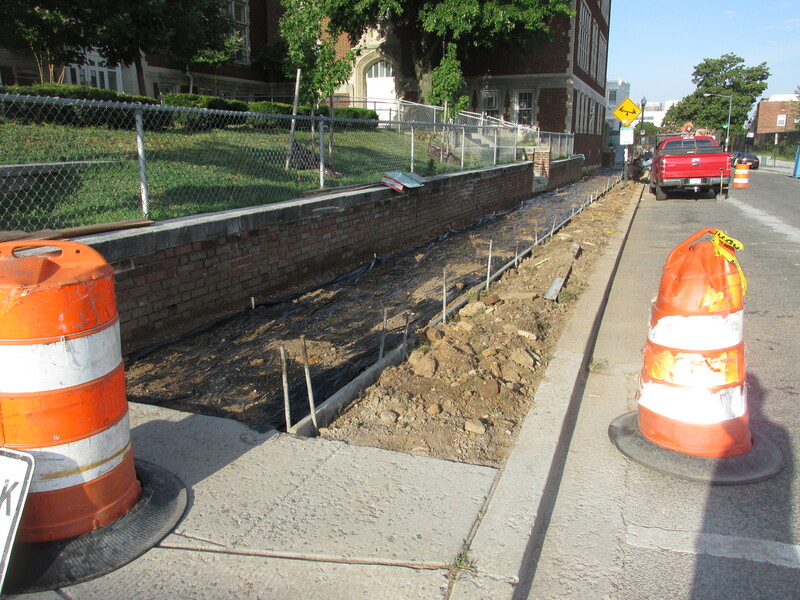 DDOT’s original scope of work was to replace the old sidewalks with new concrete exactly in the same footprint. However, in working with DDOT and visiting the site, we identified that we could add trees to this section simply by pushing the sidewalks away from the streets and pulling the existing green areas away from the buildings. In visiting the work site on August 4th, I was happy to see that work has already begun to rearrange the sidewalk and green spaces to make room for trees this fall. You make an excellent point. I’m copying Leif Dormsjo, DDOT Director so he can have appropriate personnel take up your idea. Large improvement projects, such as sidewalk replacements, can have a tremendous impact on residents’ quality of life. Because of this I feel it is critical that residents have the opportunity to review them and work with DDOT to identify opportunities to improve their neighborhoods when such opportunities exist. This entry was posted on August 6, 2015 at 7:01 am and is filed under Streets and Trees. You can subscribe via RSS 2.0 feed to this post's comments. That’s great news, thanks for your efforts Kent! Thanks for all your hard work, Kent! The pavement and sidewalks on the 600 block of Newton and 6th Street between Otis and Newton are in really bad condition— way worse condition than Otis’. THANK YOU SO MUCH for doing this! This street is going to be so much improved once the trees are mature, and I know the children who cross this street daily will appreciate the shade and beauty of a tree-lined street. Is there any chance DDOT might consider adding trees to the North side of the street as well? Otis is very wide for a one-way street and the sidewalk to the north could stand to be a bit wider….